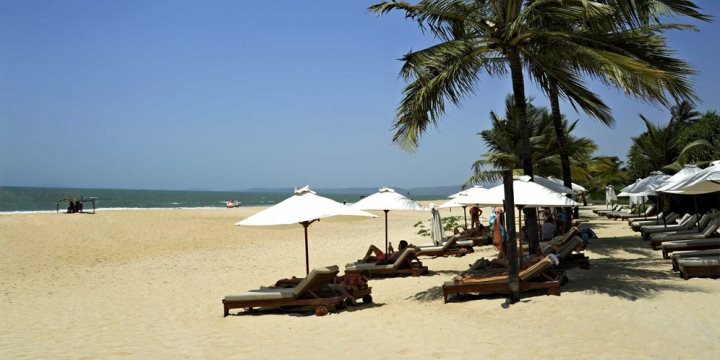 A quiet and clean resort based around a beautiful stretch of golden sand, Arossim will ensure relaxed and indulgent Goa holidays for those that descend upon its beach and colourful village. While the beach will garner much of your attention during your holiday here, colonial homes and food shacks can provide a great cultural flavour of Goa to those looking to spend time off of the sand. That being said, you’d be forgiven for spending the entirety of your holidays in Goa on the beach of Arossim. The beach remains peaceful, which is a surprise given its quality. A romantic backdrop of coconut palms and colourful beach shacks set the tone, with delicious fresh seafood available from these scatterings of eateries, the best arguably being served up in Zeebop by the Sea, which can be found just next door on the outskirts of Utorda Beach (right next to Arossim). Please find below a selection of our accommodation in the resort of Arossim in South Goa.